Just listing down things players may not be aware of about the game. I hope you'll enjoy your gameplay a bit better! Also, feel free to suggest more tips and tricks to make playing Twin Saga a hella lot more fun! - A bit outdated in terms of the site client download and the converter guide, so see below for the client download. - Updated till Lv80 Content so far, which is still applicable with the current content. - The site client from twinsaga.to is currently broken. Converter doesn't work either so kindly download the client from above. - GMs and fellow players are located here. - Press ESC during a cutscene to end it. - Don't want to mash your button opening equipment chests and gathering/fishing items? Drag them to your shortcut keys and open them. - Hold CTRL and then Right-Click all the items in your bag when you sell them to an NPC to skip the confirmation message. - [Tip by Kotetsu] Laggy when you get drops from LP dungeons? At Lv70, you can get a 2nd backpack expansion tab by finishing a Terracottage quest. Move your 120-slot backpack to there. 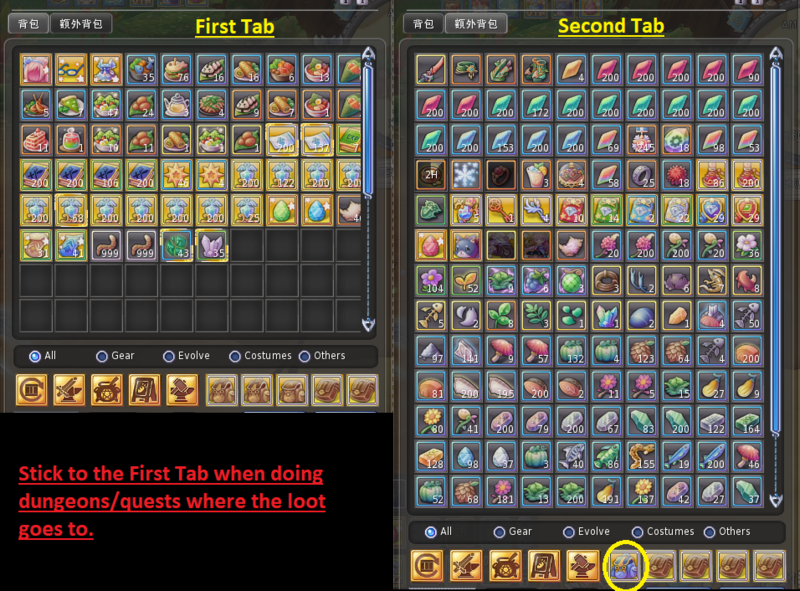 Stay on your First Tab when you run dungeons/quests where you receive drops. This is caused by your game resolution being under 1000 x 1000 (Ex. 1366 x 768, 800 x 600). B) If you can't increase your screen resolution anymore, there is a compromise you can do. Delete your client.ini in your TS folder. It will be replaced with a new one but will return your UI settings to default. C) You can also replace that client.ini that has already been modified with the settings you want before you place it into the game folder. - Recycle trash Starstones regularly to keep space free. You can also sell the Unidentified Starstones to an NPC if you're feeling lazy. - [Tip by Zefie] Want to save the LP coupons you have but it's timer is going down fast? 1) Hold SHIFT and then Left-Click the stack you want to reset and separate an amount to a new inventory slot. 2) Drag the original stack to the new stack. - You can check the loot drop list of a selected target by clicking on that small bag icon with a star on it. This works for Gathering/Fishing spots as well. For World Bosses, it will be empty as their loot chest is sent to you via mail. - Hold ALT and then Left-Click an item or gear to link them to chat. You can open the loot drop list without consuming the item by holding CTRL + Left Clicking them. This also works for items linked to chat. - Want to try on costumes without having to buy/bind them first? Hold CTRL + Left Click on the costume icon in the Item Mall, Auction House, Costume Collection Album or your backpack. This also works for costumes or weapons linked to chat. - You can try them all on even if you don't own the costume yet. The Album can be used as a storage for all your costumes. Reminder that it binds the costumes to you if you place them in here. Also, the Costume Collection Album is not complete. Newer costumes have not been updated into the Album. Last edited by Jewel; 03-25-2019 at 07:23 PM. Thank you! Hopefully this helps with the hassle experienced while playing the game if you didn't know these nifty tricks.